Keyman Desktop will automatically set up your computer for best performance with most Keyman keyboards. However, for best performance on some keyboards you may need to manually associate your Keyman keyboard with a Windows language and layout. Correctly associating your Keyman keyboard has three main benefits. When a Keyman keyboard and Windows language are correctly associated, turning one on will activate the other. You won't need to adjust both every time you want to use your Keyman keyboard. When a Windows layout and a Keyman keyboard are correctly associated, you can be sure you are using a Keyman keyboard as it was designed. 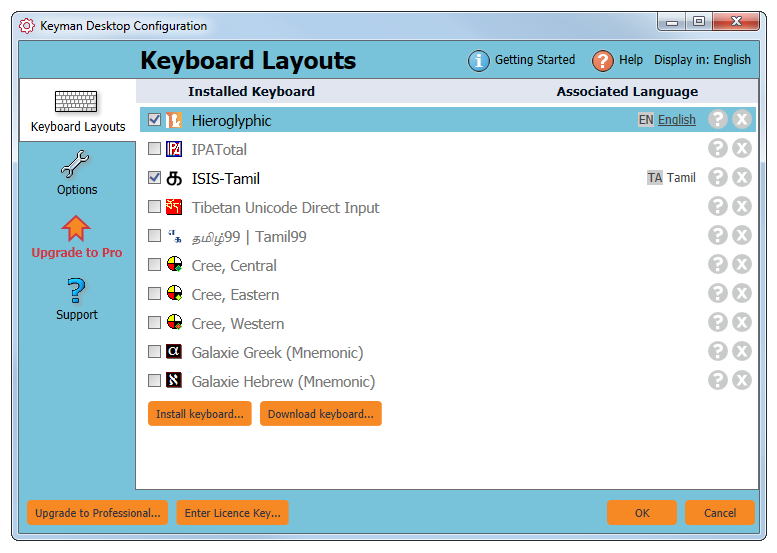 This is especially helpful if you are using a non-English hardware keyboard as your Windows layout. For example, if you are using a Spanish, French, or German hardware keyboard. Applications will know which typing direction to use, left-to-right or right-to-left. This is necessary for right-to-left languages like Arabic, Hebrew, and Farsi. Applications will know how characters and symbols should be rendered. This is partucularly necessary for many Indian languages. Applications will know which language tools to use when spell checking what you type. 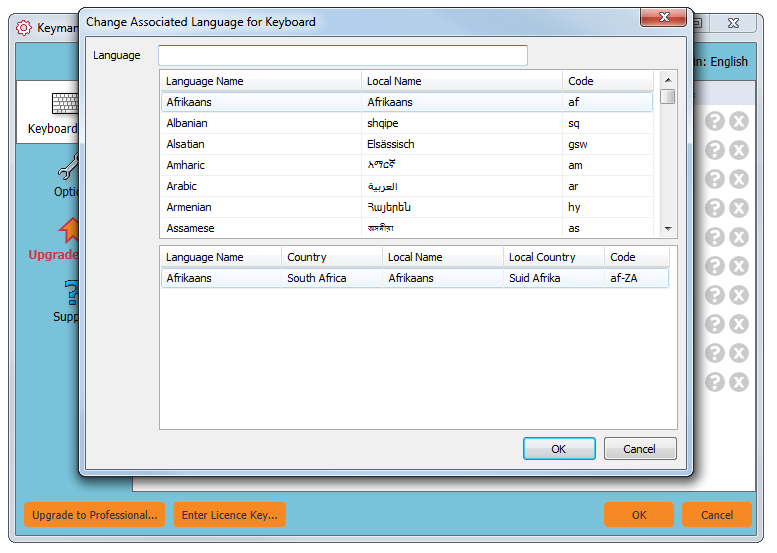 For the selected keyboard, click on the language name under the 'Associated Language' column. The default language is your Windows default language, or the default keyboard language specified in the keyboard file. 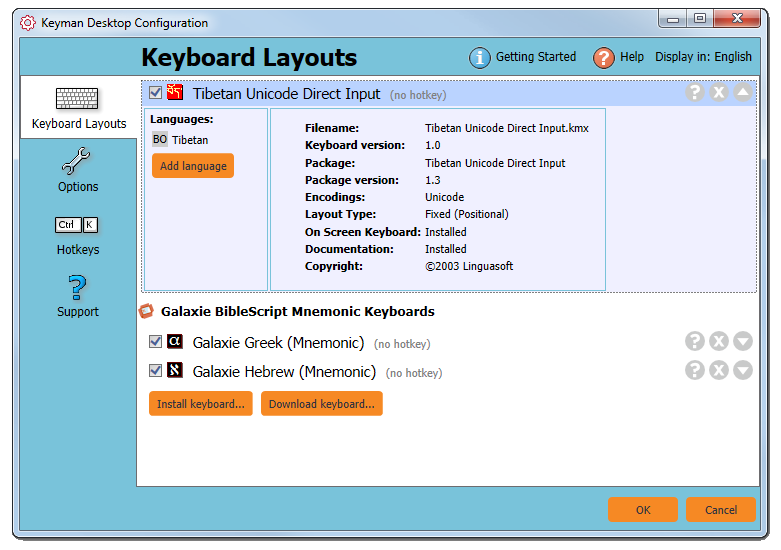 The Professional edition will let you associate multiple Windows languages to a keyboard. Click on the down arrow ( ) beside the keyboard name. To remove an association, hover over the language name, and click the button that appears.